Dragon version by Ciaran Anscomb, 2018. Original BBC Micro version by Julian Avis for Bug-Byte, Copyright 1987. A .wav file, which can be recorded onto tape for loading into a real Dragon. A .cas file, another tape image, is better supported by some emulators. A .dsk file, a 40 track single-sided floppy disk image that can be transferred to a real floppy disk or used directly with a CoCoSDC. Redistribution encouraged! Just be sure to include the documentation with any packaging. See the Source Code page for instructions on building from source and copyright information. The great demon Mackscrane has stolen the Chalice of Binding and hidden it in the Dunjunz complex. Up to to 4 players must fight their way through 25 puzzling levels filled with monsters and traps. Find the Chalice, raise it to the heavens, and save the world! Each player has their own view of the current level, and can explore independently, but co-operation is essential! Most levels are protected with a series of doors, and that key you're holding might get you all to the exit! Players have different abilities, and enter equipped with magical weaponry and armour gifted them by the Gods. Each may be upgraded by finding special items. The Ranger and Magic-User are more poorly equipped, but with exertion can cast magic that destroys all monsters in sight. Cassette systems: Type CLOADM and press Enter. Loading time should be approximately 1m 40s for 32K machines, or 2m for 64K machines. 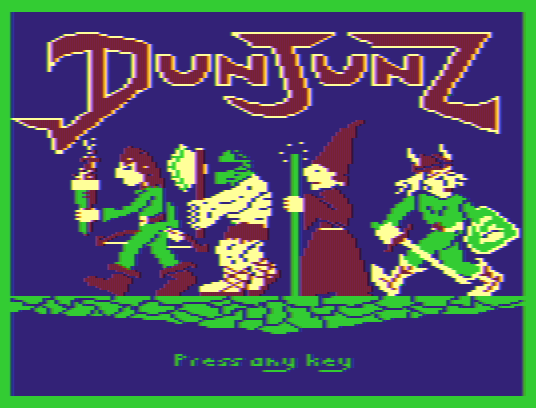 Dragon disk systems (DragonDOS): Type BOOT or RUN"DUNJUNZ" and press Enter. Tandy CoCo disk systems (RSDOS): Type DOS or RUN"DUNJUNZ" and press Enter. The main menu lets you select which characters will play, the difficulty level, and the video mode. Controls for each player are also summarised here. Keys 1–4 toggle whether each character is playing. Select difficulty mode with D. To start the game, press Space. Change video modes by pressing V. PAL and two NTSC modes are available. Pick the one that looks best on your display–ideally, the Magic-User character will be red! Players start each level together. Be sure to watch the right window! Current player status and score are shown down the right hand side of the play area. Small icons will appear to show if a player is holding a key, or is wearing Boots of Speed. Every player starts with 99 health, and takes damage from various hazards. Fall below zero and you're dead! The Ranger and Magic-user can both use magic. Magic eliminates all monsters they can currently see, at a cost to their health. Each key opens one specific door. In easy mode, these come in two different colours. The exit allows you to descend to the next level. Only one player needs to make it to the exit alive. The Gods will resurrect anyone else who died, but they will lose any magical enhancements they may have collected. Food and potions recover your Hit Points, though potions work in mysterious ways. The Cross of Resurrection will bring back to life one of your companions. Boots of Speed let you cross great distances in the blink of an eye–until you stop to pick something up. Beware the Energy Drainer traps; they take a great toll on your health. Armour increases your resistance to attacks from monsters. Maximum armour class is 7. Power makes your attacks more effective. Maximum strength is 9. Ammo allows you to fire more weapons at once, up to a maximum of three. A teleport will magically move you to another part of the level. Monsters enter the level through the trapdoors. Press Break to pause the game. Any key to continue. Press Enter+Break to restart the game. Digital gamepad style controllers (with a suitable adaptor) are recommended for players 3 and 4. 2 Magic-user P + < > 0 ? Stewart and Eddie Orchard, who provided initial encouragement and a lot of good early feedback. But also to a host of others for their kind words & useful comments.